Should the Wild Chase the 4th Overall Pick? Peter Chiarelli is looking for a dancing partner to finally get the Oilers showing tangible signs of improvement. Chuck Fletcher is attempting to prove to fans and ownership that the Wild aren’t a team caught in permanent limbo. The fourth overall draft pick at the 2016 draft might be an occasion for both GMs to take steps toward their goals. Chiarelli has said that there’s a “legitimate chance” the Oilers trade down. He’s also said that he’s fielded calls already from teams inquiring about the pick. “I’ve made it known we would look to trade down if the right deal is there,” he said Monday on Edmonton’s “Oilers Now” radio show. Edmonton has had plenty of top picks over the years — this will be only the second time in six seasons that they pick outside the top three — but the prospect of selecting fourth overall almost doesn’t work for them, knowing what they may be able to get for the pick. Getting a good player is always, well, good, but the team’s clear weakness is defense. On most team’s draft boards, the best player at fourth overall is almost guaranteed to be a forward. Selecting a defenseman with the fourth overall pick may be going off the board a bit. Jacob Chychrun has been ranked that high, but if he’s Edmonton’s prize, they can probably trade down a few slots and still get him. If they’re happy with other top defensemen Olli Juolevi and Mikhail Sergachev, they may be able to trade down even further. If Edmonton’s weakness is defense, trading down to pick a defenseman and get a defenseman in a trade makes sense if it can be made to work, and that’s what Chiarelli has said he’s looking to do. Enter: Fletcher and the Wild. A team that could use a prospect pool boost and is one of a handful of teams with the defensive depth to make a move like this and not decimate their blue line for the coming season. The class of 2016’s top group consists of three players, Auston Matthews, Patrik Laine and Jesse Puljujarvi. The next best players are widely considered to be a step below that trinity, making it a near certainty that those are the three off the board when the fourth selection is announced. That gives the team picking fourth a clear picture of who should be available. There will be very little guess work involved. The Wild’s two biggest organizational needs are at center, where they have a couple prospects of interest, but few destined for a top six role are a natural center. The other need is an elite scoring threat, something missing since the days of Marian Gaborik. The team has the potential to fulfill one or both of these needs with Edmonton’s pick. While defenseman Jacob Chychrun pops up on some rankings into the four-five-six range, the three players that are widely considered to be the heart of that next class are Pierre-Luc Dubois, Matthew Tkachuk and Alexander Nylander. That’s a nice platter for Fletcher and his scouting staff to choose from. Three high-scoring forwards, who all bring a little something different to the table. Tkachuk can play a gritty two-way game, is a hard worker and is more than capable of putting up some points. He fits the mold that the Wild are currently working with. He’s a left wing — where they aren’t particularly weak — who has his Dad’s mean streak and nose for the net. The 17-year-old Dubois is a late birthday (that matters) power forward, who is a strong skater and an offensive threat. He’s good defensively, and a strong, physical presence on the ice. Importantly, he can play center. That’s significant. He ticks two boxes on the “does he meet our needs?” checklist. Nylander is also a late birthday, who has shown himself to be an explosive skater and an incredibly smart and creative forechecker. He’s smaller than the other two and may not be as capable of jumping straight into the NHL as either Dubois or Tkachuk. However, you aren’t drafting players based on how many games you think they can play in the 2016-17 season. The Wild would be looking at three skaters who fit the bill of their greatest needs and present some different profiles for the Minnesota braintrust to debate. Additionally, making a splash like this could salvage a draft where the Wild aren’t going to be very involved. They have only four picks: a first round pick, a fourth round pick and two seventh round picks. It’s not a great way to replenish the cupboards. Making that first rounder a fourth overall selection could salvage the draft. A deal like this is almost inevitably complicated. Teams have their own valuations on what picks at different levels are worth, and moving them around gets messy. Furthermore, moving a top-four defenseman can make it even more complicated. The deal could quite easily be more than a defenseman and a pick for a pick. In fact, it’s very unlikely to be that simple no matter who Chiarelli takes to prom. So, no sense predicting what a fully fleshed out deal looks like, but there will be a defenseman involved, and it’s going to be a player the Wild will miss. You don’t get something for nothing. Whether that’s Matt Dumba, Jonas Brodin, or Marco Scandella, it will hurt. The hope just has to be that the two who aren’t traded, along with Jared Spurgeon and Ryan Suter, are capable of creating a solid top four and that players like Gustav Olofsson, Mike Reilly, or even Nate Prosser and Christian Folin, are able to stabilize the third pairing. An unspoken benefit of this move for Minnesota would be discovering some cap flexibility. They’re up against it this summer. In the absence of a buyout — Thomas Vanek is a name that’s being thrown around as a buyout candidate — Fletcher’s ability to make significant moves to address the perennial issues on the roster are limited. They have $63.8 million committed before re-signing restricted free agents such as Matt Dumba, Jason Zucker, Darcy Kuemper, Jordan Schroeder or Tyler Graovac. That is also prior to noting that even after Zucker gets a deal, they only have nine forwards on contract at that amount. Justin Fontaine, David Jones, Jarrett Stoll, Ryan Carter and Chris Porter are all UFAs. While the absence of any one of them won’t dismantle the team, those are still contracts that need to be given out one way or another. Moving a defenseman out in a trade like this is going to provide some relief in a deal that isn’t about cap relief. You don’t want to just ship guys out because you have to. That leads to situations where Chicago loses Nick Leddy and finds themselves desperately in need of defense. Or, even worse, you part with a key piece and get next to nothing in return, like Chicago trading Patrick Sharp and prospect Stephen Johns (who was a Dallas regular in the postseason) in exchange for Trevor Daley and Ryan Garbutt, neither of whom gelled in Chicago and were traded before the trade deadline. Getting ahead of that kind of late summer cap problem is important. There are many examples beyond those given of what happens when you need to make a move too late and are forced into a deal where part of what you acquire is cap space. Johnny Boychuck being traded to the Islanders for picks four days before the season opener is a great example. That’s a trade that was engineered by Chiarelli himself, and ended with Boston missing the postseason, in part, because of troubles on the blue line. This is a move that’s entirely possible, but it’s a commitment. You can’t get something without giving up something and it’s a move that, in its most basic form and in a vacuum, doesn’t make the team better this year. It’s a move that seeks to rebuild on the fly, not entirely unlike Pittsburgh has done, where you aren’t selling out the team you have, but are seeking to augment via trade what you aren’t going to do by tanking (especially after signing Bruce Boudreau). Are they a worse team next year because of a move like this? Not necessarily. Opening up some cap space means opening up space to make the team better now and push forward with a strategy for the future. Acquiring draft picks or trading up isn’t a bad idea for a team that has just four picks in the 2016 draft, and the next pick after their 15th overall selection is a fourth round pick. 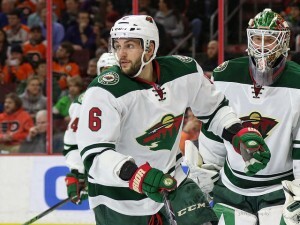 The Wild are somewhat surprisingly well-suited to become a trade partner for Edmonton.